Most children HATE sandwich crusts. Most moms can make an entire meal out of their kid’s leftovers, especially the bread crusts. Never underestimate the power of peanut butter and jelly sandwich crusts with coffee. It’s the busy mom’s breakfast of champions! Coffee is necessary for life and should be its own food group. Look ma, no more carpel tunnel! 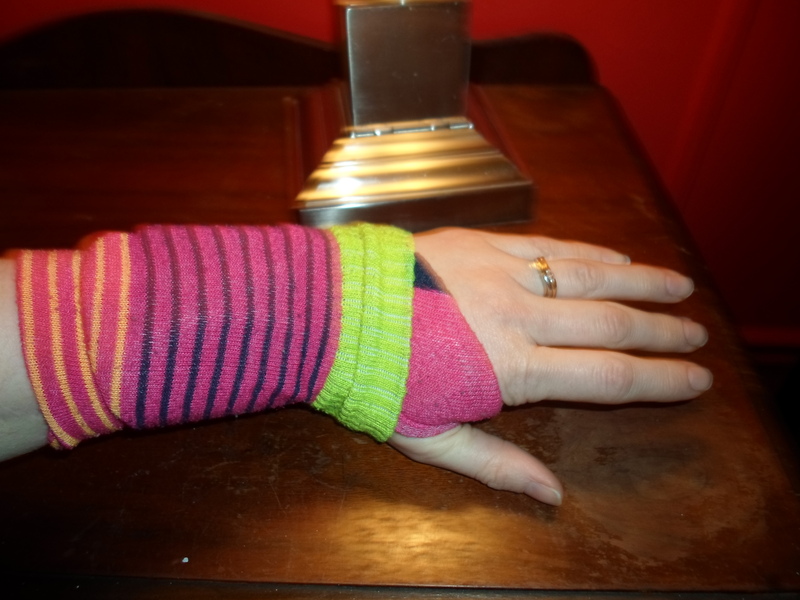 Speaking of carpel tunnel, you can make your own wrist cozies for your wrist braces out of socks. (This is especially useful if you need to wear your braces at night.) Take a pair of soft socks. Turn them inside out. Cut off the toe. Cut out a tiny notch in the heel. Now, put the socks on your hands like mittens, thumb goes through the hole in the heel. Put your wrist brace on OVER your sock-encased hand. Fold the toe portion of the sock over the brace. Fold the top elastic of the sock over the brace. Voila! Your wrists are cozied. The socks wick away moisture, keep the braces clean, and prevents the velcro closures from becoming snagged on clothing. Plus, you can color-coordinate them with your outfit…or not. I have conservative socks I can wear, but I usually prefer the Pippi Longstocking look while wearing my braces. Snazzy! Ladies, an oversized purse makes a great tool pouch. 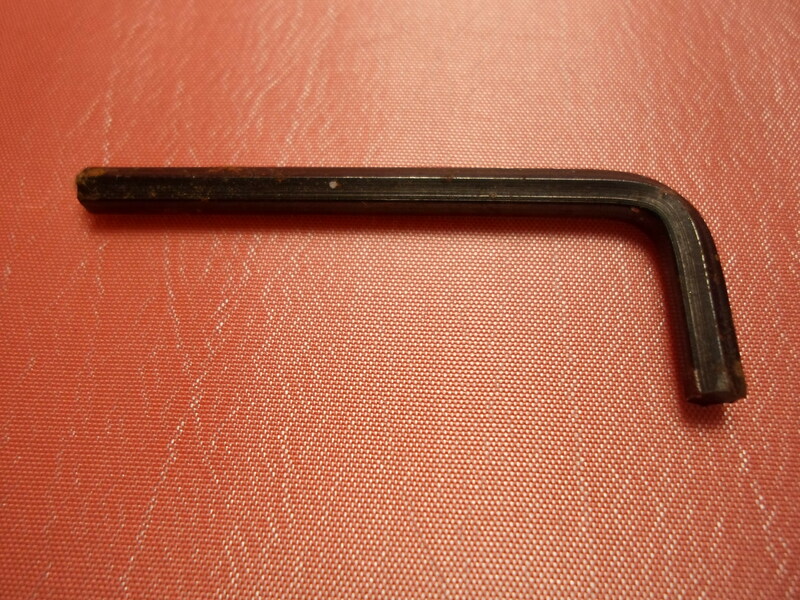 You’ll never have to search for those missing tools. Added bonus, the men in your life might “borrow” tools from a toolbox, but they won’t touch a tool purse! 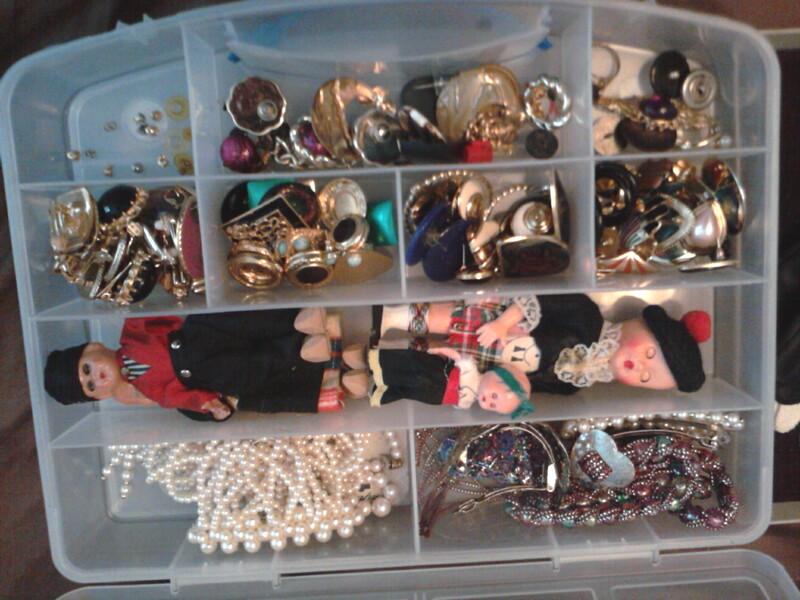 Hardware boxes and fishing lure boxes are great for storing crafting items and jewelry. I have no idea where this creepy doll family originally came from. But they’re mine now, so they have to live somewhere. Waffle irons can cook more than just waffles. Lip pencil lasts far longer than lipstick. Use cheap pencils, the kind that need to be sharpened with a pencil sharpener, and color the entire lip area. There’s no point to buying brown sugar when you can make your own. Mix a cup of regular sugar with a spoonful or two of molasses. You’re welcome! Microfiber cloths will clean just about anything. You can plant tomatoes, but they’ll never be as hardy as the ones that self-seed. The freebies that show up the following year are practically bullet-proof! If your child is old enough to work an electronic gaming system, they’re probably old enough to do their own laundry. (With adult supervision, of course.) Do you really want to touch your kiddo’s grungy socks? I think not! You can make your own pre-cooked frozen meat crumbles. Take your ground hamburger, cook it all the way through, place it on a parchment-lined sheet, and stick it in the freezer. Once the meat is frozen, you can store it in bags or containers in the freezer. The next time you need a little ground hamburger for your pasta sauce, just grab a handful from the freezer. The meat is already cooked, so it just needs to be thawed/reheated. Easy! Everyone has crap they need to purge/organize/donate. Some of us are just better at hiding it than others. Don’t save your fancy anything for a special occasion. Life’s too short to worry about stains and broken plates. Macaroni and cheese dinner on Great-Grandma’s china? Yes, please. If you tell people you write vampire stories, you can guarantee they will look at you like you’ve lost your marbles. All of them. You can say, “Wait! Mine are different!” (The vampires, not the lost marbles.) Anyway, it doesn’t matter. You might as well say that you regularly play checkers with your pet unicorn. That’s how serious you’ll be taken as a writer…and as a person. *Last week, I signed up for two classes through WordPress: Writing 101 and Blogging 101. This is was my second assignment. What a smart and entertaining post! 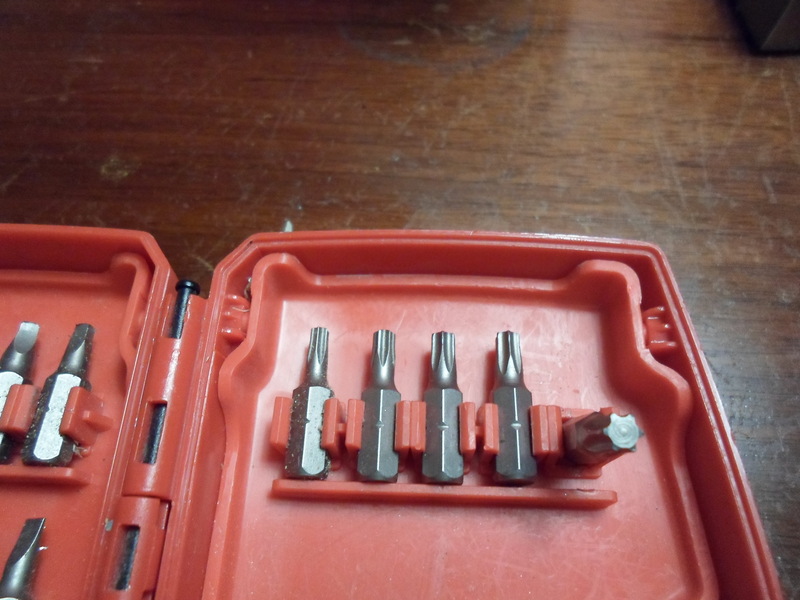 am still laughing, and intend to take your advice, about the purchase of a large purse for my tools! Great advice – #20 – OMG!!! yes!!!!! #9 – I love the creepy doll family!